People with diabetes require medicines to control their blood glucose levels, blood pressure and blood lipids, equipment to monitor their blood glucose levels, and a health care system that is able to provide integrated and comprehensive care to all parts of the country. Unfortunately, the quality of care for people with diabetes varies widely around the world. In many high-income countries, people with diabetes have access to all components of care. In some other countries, quality care is inaccessible or unaffordable. Continuous accessibility to medicines is still a major problem in many less-resourced areas, especially in low- and middle-income countries. In the case of insulin, the lack of a reliable and continuous supply can lead to severe illness and death. 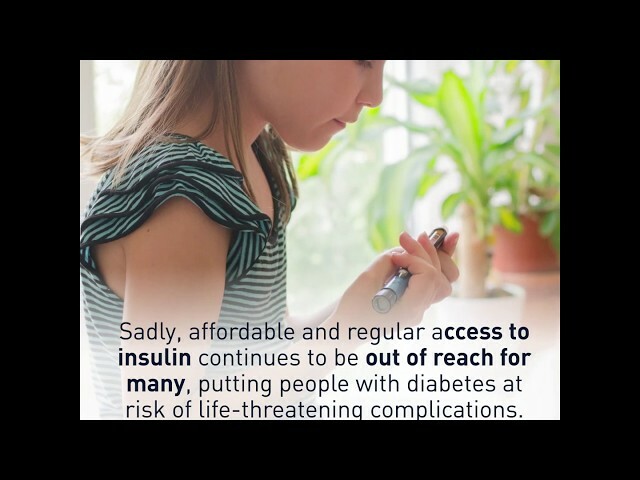 Nearly 100 years after the first use of insulin, it is a sad fact that in many parts of the world, people with diabetes struggle to afford and access it reliably. The International Diabetes Federation estimates that approximately 4 million people die each year as a consequence of diabetes. Many of these deaths could be prevented with proper access to medicines and supplies. Often the total supply of the medicine is less than required, there are transportation problems, or the medicine is not available in regional areas. Solutions to improving access include increased education of health professionals, reducing taxes and duties, promoting competition and high-quality generic medicines, differential pricing, good procurement practices, and open access to pricing information. On occasion of the UN HLM on UHC, IDF is urging global leaders to leave no one behind and ensure all people with diabetes have access to essential care and medicines at an affordable price. Learn more. In 2016, IDF conducted a global survey on the perspective of people with diabetes and health professionals on Access to Medicines and Supplies for People with Diabetes. The report introduces diabetes and related medicines, provides the perception of people with diabetes, and health professionals on the availability, access and prices of medicines and supplies from around the world, and outlines public health policy solutions. Insulin, in its various types, was always available at the service delivery point in over 80% of high-income countries, compared with less than 15% in low income countries. Other diabetes medicines, such as metformin and sylfonylureas, were available in over 80% of high income countries, compared with less than 20% in low-income countries. The availability of diabetes supplies varied between close to 80% in high-income countries and less than 15% in low-income countries. IDF conducted the survey so that policy makers, policy implementers and diabetes advocates can have an accessible summary of the current data on availability, access and prices of medicines and supplies from the view point of people with diabetes. Evidence on actionable solutions has also been included. The report hopes to facilitate evidence on the daily challenges faced at the ground level and encourages inter-sectoral collaboration to strengthen health systems and improve access to medicines and supplies.